Providing feedback tools and consulting services anytime, anywhere on any topic, including 360-Degree Feedback, Culture, Climate and Employee Satisfaction surveys. IPR will develop and administer a 3600 or survey program customized to the needs of your organization. 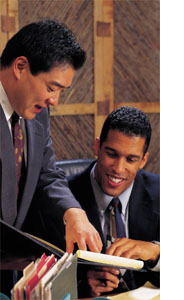 Leader development - Executives, managers and supervisors can diagnose skill strengths and areas for development. Individual skill development - Team members give each other feedback about personal leadership, team interaction and workplace skills. Needs assessment - Study aggregate performance data to decide how much to invest for training and development programs. Competency development - Get feedback about draft competency lists. Ask stakeholders to rate the importance of the behaviors. Level 3 evaluation of training - Administer customized surveys based on course objectives before and after training. Organizational climate surveys - Collect information about the organization's vision, values, policies, structure, communication and management support.